I think this DIY puzzle project breaks the rules of Montessori but I'm sharing it anyway because it has worked for us. And it's fun to make. And it's fun to break the rules sometimes. 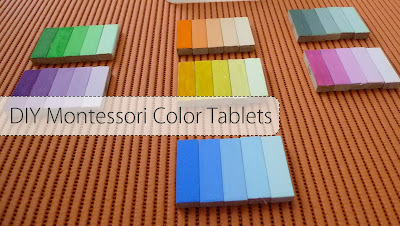 To those who went "whuuuut": color tablets are used in the Montessori classroom to teach visual sense. Montessori curriculum makes a big deal out of building a hands-on intelligence of all five senses as the foundation for all creative work in the future. That makes a lot of sense to me. Sensory intelligence means things like light-dark, loud-soft, large-small and so on. There are specific puzzle materials used to teach a single concept. There are three color tablet sets and it's easy to make them all. I'll get to the rule we're breaking in a minute. We made tablets in color box 3, which is all about grading colors from light-dark. In hindsight, I wish I started with color box 1 but I didn't plan this ahead. All you need is Jenga blocks and poster paint. The block game was gifted to her two Christmases ago, and it sat in a closet until I saw this by LivingMontessoriNow and Earth Friendly Mama for number rods. I used the idea to make color tablets instead because I don't homeschool. I just wanted to bring some Montessori toys in the home and leave them behind for her to play with while I was at work. (Confession: this was yaya's assignment, but doing this with children could be fun too). Painting different materials is just so fun! Depending on your child's age, be very easygoing about this. I learned this the hard way. The classroom tablets have 7 hues per color. We used 6 here, but I found doing 4 hues is just enough to get a noticeable difference. Any more and it became more trouble than they were worth. Now this is where I broke the rules, because as I'm reading through a Montessori book, "Child of the World" it writes that sensorial puzzles have no place in the home because they are meant to be used in a very specific way to isolate a concept to learn. If you'd like to see how the real presentation to the child should be, check here. Interestingly, they worked better as leave-behind play on her shelf then they did as our floor time activity. I left two color sets at a time, and a little box for her "answer space". Here she is doing the last two colors this weekend. From the DIY project to finishing the last color puzzles, it took six months. It wasn't her most favorite activity on her shelf and she went at her own pace with them, which is fine. More than fine. That's longer than the interest lifespan of half of her toys. And later when she's a little older, we'll have some colorful Jenga blocks to play with. I'm sure there's no rule against that! Thanks to Deb of Living Montessori Now and Elaine of Planting Peas for sharing this post! 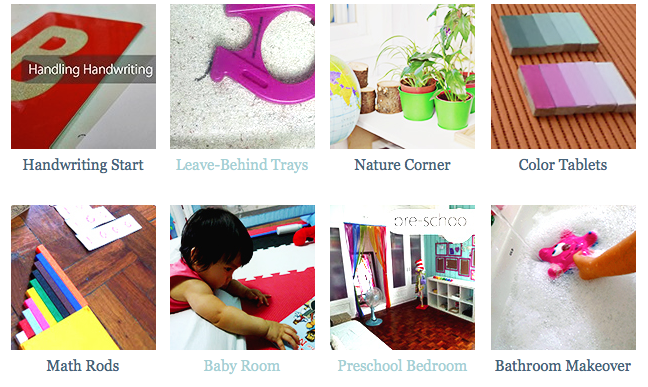 Montessori Gallery on the sidebar. Elaine, I'm so glad you found me because I found your absolutely amazing site!